Practical Guide about SEO,Google Adwords,Google Analytics,Social Media Marketing & Web Hosting. According to en.wikipedia.org · The Digital marketing is an umbrella term for the targeted, measurable, and interactive marketing of products or services using digital technologies to reach and convert leads into customers. The key objective is to promote brands, build preference and increase sales through various digital marketing techniques. It uses various internet based mediums to achieve above objectives. Good post. I learned about digital marketing. Thanks for sharing. Kindle - For Joy of Reading. How to Submit Blog to Google Search Console? How to Create Facebook Business Page? 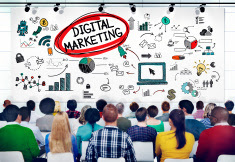 Digital Marketing - A New Career Options for Youths.. Copyright © 2016 DigitalOsho .All Rights Reserved. Awesome Inc. theme. Powered by Blogger.